2. Oct 2003 - And there was life! 6. Sep 1999 - G'boing! 14. Nov 1997 - amiga.nvg.org. 7. Oct 1997 - More Linux/m68k stuff added pluss more. Every now and then I get email from people who want to know more about runnig Gentoo Linux on their Amigas, so it's about time I write something about how one can accomplish this. Some time ago I got an account at one of the developer web sites at gentoo.org where I upload binary packages for Gentoo/ m68k. I have also added a link from the Linux/m68k page. A couple of months ago I experienced some problems with the BLizzard 1260, where it suddenly stopped working. After some fiddling I discovered that it did not work with the SCSI-controller attached, which was a problem since that's also where the 128MB SIMM is located. First I thought it was the power supply, but after having that replaced with a new one I put together, it still didnt work properly. In order to get a quick fix, I ordered a 64MB SIMM for the Blizzard to replace the 16MB that was attached there. Right before I got the new SIMM from Datakompaniet, I was playing around with the SCSI controller in my hands and decided to pick out the one socketed chip on it. That was easy enough, and I put it back in, and just for fun attached it to the machine again to see if it made any difference - and it did! So now the box has been upgraded to a whopping 192MB of Fast-RAM, and today I also installed the second PCMCIA bender that I got from CISC in Oslo just before christmas, so the PCMCIA card is now bendt in over the motherboard, which means I can finally close the case. I have also put up a dedicated page for the box. A few months ago I bought a Blizzard 1260 with 144MB of RAM that I have now installed in a new rack-mountable A1200 system with 60GB of disk and after a week or so I had a new, almost from scratch, installed Gentoo/m68k system - chetter.kolla.no. The last few weeks this new system has been busy building binary packages, which I have successfully installed on daneel (a.k.a. amiga.nvg.org). There are now just a handfull of packages left before the entire system has been rebuildt and updated. This means the this web-server has been upgraded from Apache 1.3 to Apache 2.0 (2.2 soon I guess) and from PHP4 to PHP5 - and the server is now also at last available through IPv6 - fantastic! In addition to the Blizzard 1260 I also bought a CyberStorm mk-III with 68060 and 128MB RAM, and I hope to have yet another Linux/m68k system running in a few months, I just need to find time and space for it. Since I have now moved into a new apartment, this should not be a problem. I will also put the m68k packages I build online somewhere, not quite sure where yet, maybe on this server, but I think it might be smarter to put them on a faster system. It's amazing how time flies, this old machine is now more than 11 years old. I remember I bought it for my own 20th birthday, in January 1994, back when computers was a new thing for me. It was my first machine ever, and I learned most of what I know about computers from playing with it. Considering how long it has lasted it was worth every krone, hopefully it will continue to work well in the years ahead. Cheers! As mentioned in my previous entry, I migrated the setup from old RedHat packages to the Gentoo portage system. This migration is now complete, the very last rpm-packages were removed during early summer of 2004, if I rememer correctly, and I must say I am now happy with Gentoo/m68k. Some months ago I met Mike Frysinger (aka vapier@gentoo) on IRC #gentoo-arm (freenode) and he was kind to establish a linux/m68k profile in the Gentoo portage tree, just for me! Later we have been chatting about getting our hands on some ColdFire developer boards to expand the m68k effort. 6. Sep 1999 - G'boing!! Another significant change is the use of virtual webhosts, both RAMS and The Linux/m68k Home Pages are such virtual hosts. Perhaps we will do the same for the UAE discussion board and the ADF archive also, yet to be decided. Ah, and now I've mentioned another thing that is new, the UAE Discussion Board which is a board where users of UAE share their experience and knowledge. The board is maintained by Warlock who also is resposible for the constantly ADF archive which now features over 500 demos. So, what's on the to-do list? Well, first of all I want a revamp of the layout of amiga.nvg.org, I've been thinking about it for months, but has so far not managed to pull off anything (how typical :) .) 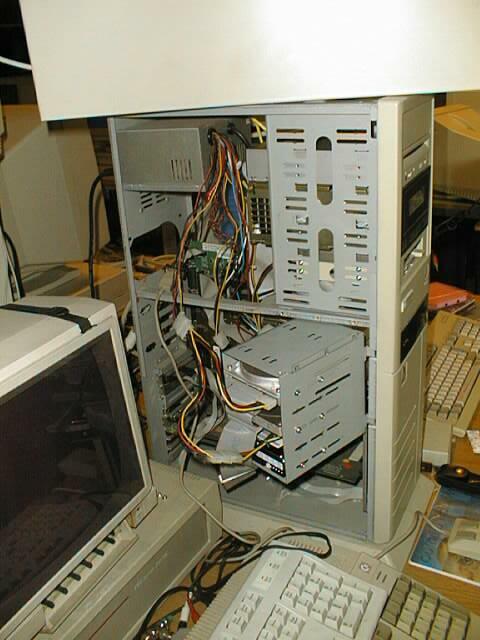 Secondly I would like to get a new tower for the machine, the current PC Tower solution is somewhat messy and fragile. I've been looking around and even though it's not the technically most advanced solution, I think the Infinitiv-II towers frim Micronik will be it, at least it looks good, and the pricetag isnt that scary. Well, I think that's it for now, the next update will most likely be in august next year, august year 2000, wow time flies doesnt it? Well, what can I say, I'm a lazy guy. To put it short, our adf archive has got a new layout, the RAMS pages are avaible from the main page, a support link to Operation Clambake has been added, and also a link to Amiga Info, a magazine I would like to recommend for those who can read swedish. From now on this site is also avaible as http://amiga.nvg.org/. Also added link from the Amiga Section to the good old NVG Amiga Homepage, and winded up Warlock's ADF archive. 1. June 1997 - Added Linux/m68k stuff! A mirror of the official Linux/m68k Home Pages is now avaible under <http://amiga.nvg.org/mirrors/www.linux-m68k.org/>. The Linux/m68k pages are still under construction, not sure what to put here, perhaps some debian packages (if I ever get around to make any :) ). 31. May 1997 - amiga.nvg.ntnu.no is now back up with a web-server! After some major hardware upgrades, including a towercase and a a2o65 ethernet card, amiga.nvg.ntnu.no is now fully back in business. Expect a page with more hardware info coming up soon ;) Currently the site containes a adf archive with old amiga demos for use with UAE (Unix Amiga Emulator) maintained by Warlock, a python archive maintained by Sk and general amiga stuff, maintained by Kolla. running on Gentoo and Linux/m68k.